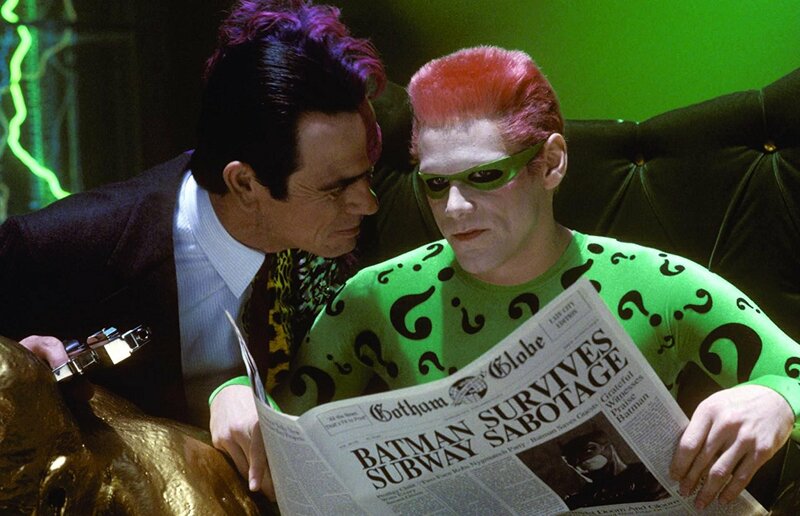 In an interview during an episode of Norm MacDonald Live, actor/comedian Jim Carrey revealed that Tommy Lee Jones couldn't stand him when the two worked together on the 1995 film Batman Forever. Jim had the role of Batman's maniacal nemesis, the Riddler, while Tommy played his evil co-villain, Two-Face. Although the two teamed up on-screen, off-screen they were apparently not close friends. Jim recalled the moment he learned Tommy's true feelings, when the two ran into each other at a restaurant during production. He told Norm, "The maître d’ said, ‘Oh, I hear you’re working with Tommy Lee Jones. He’s over in the corner having dinner.’ I went over and I said, ‘Hey Tommy, how are you doing?’ and the blood just drained from his face." Jim revealed that it was before their biggest scene together in the movie, adding, "He got up shaking -- he must have been in mid-kill me fantasy or something like that. And he went to hug me and he said, ‘I hate you. I really don’t like you.’ And I said, ‘Gee man, what’s the problem?’ and pulled up a chair, which probably wasn’t smart. He said, ‘I cannot sanction your buffoonery.'" While Jim had made a name for himself playing goofballs and eccentric characters in three films leading up to Batman Forever, notably Lloyd Christmas in Dumb and Dumber, Stanley Ipkiss in The Mask and Ace Ventura in Ace Ventura: Pet Detective, Tommy had won an Oscar for his performance in the drama The Fugitive just months prior to filming. So his role as the insane Two-Face opposite the eccentric Riddler may have rubbed him the wrong way. I heard that long ago. I wonder if feelings have since changed? Maybe interview Tommy Lee Jones now and hear his side. People get along or they don't. Whatever! Who Cares ? Trump is the ONLY News worth reading ! Chuck Jones was an amazing artist and creative genius. I can never forget some of the greatest cartoons I ever saw as a kid. However, according to people who worked with and knew him, he did have issues with a big ego and jealousy towards co-workers. He had a list of people he hated, including Leon Schlesinger and Bob Clampett, both pretty nice guys. So if he hated Jim it wouldn't be that far off the norm for him. But Tommy could sanction the buffoonery of MAN OF THE HOUSE. Uh huh. I guess you can sanction a lot if they pay you enough. I've heard Tommy Lee Jones pretty much hates everyone.